The Insects of Spring……Some are Coming, Some are Here….! 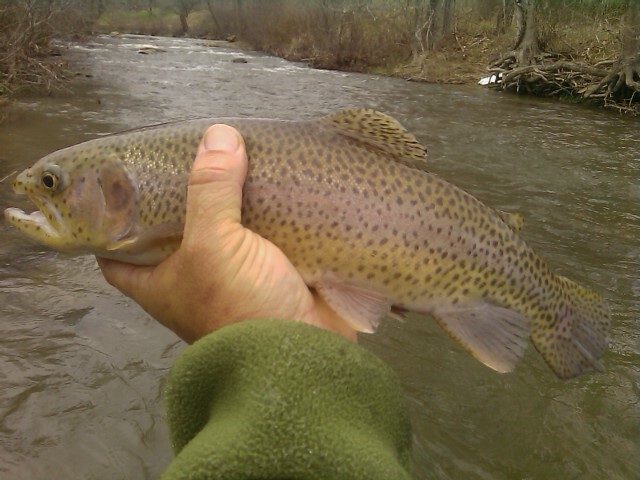 Thurs….Mar.31, 2011…….Last night, today and this afternoon haven’t been as bad as was originally forecast, and with the mtns receiving anywhere from .25″ to .60″ of rain everything looks to be shaping up again for some great fishing over the next several days. There’s still another potential shot of rain coming tonight, then it looks like just a slight chance of light showers and snow showers for the weekend. I am guiding Dr. Ken Karb, Greensboro, NC, Dr. Hy Muss and Dr. Rich Goldberg, both of Chapel Hill, NC. We will be doing a two day trip and I will be returning on Saturday evening. Looks to be moist but the fishing should be pretty good. 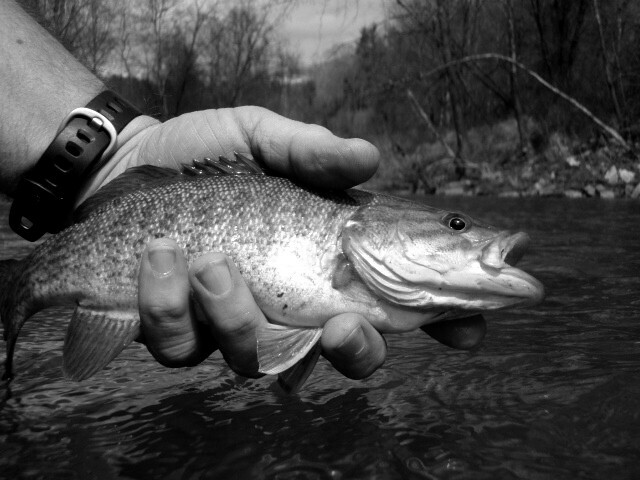 Below are some freebies from me to you, a Printable April NC Mtns hatch chart and a printable TN Tailwaters Hatch Chart. Both are PDF files and can be opened and printed from any Adobe Reader program. 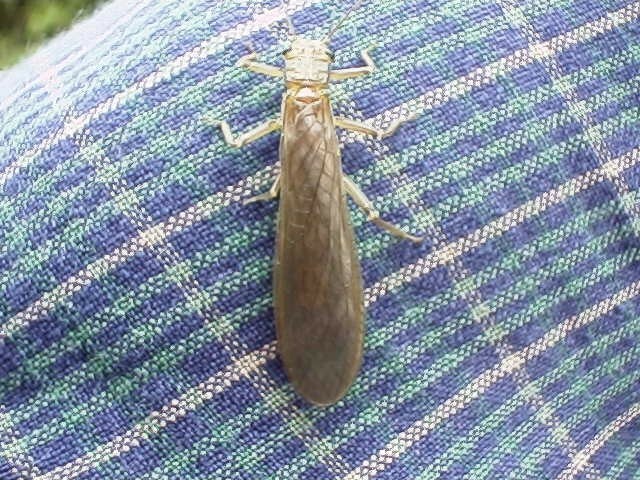 A lot of bugs are on the horizon and the next few months are when we get our classic hatches……Sulphurs, Hendricksons, March Browns, Grey Foxes, etc…….Now if the water conditions will come down a little we should have some good dry fly fishing…. Have a great day today! Good Day, Cool Weather and More Wet Weather on The Way………. Wed…..Mar. 30, 2011……..Had some interesting trips so far this week, the weather has been all over the place, warm, cool, cold, back to warm…..sunny, heavy rain, sleet, drizzle, heavy wet snow, windy, no wind…..you name it we have had it. Its been a mixed bag and the fish have been constantly facing changing conditions which can make them more difficult to locate and catch. I guided Susan Singer and Claudia Cannady on Monday and we had an enjoyable day with rain and heavy snow early on but it stopped about midday allowing us to get in a good bit of fishing without getting soaked. We caught a good number of rainbows and lost a few too. Tuesday I was up and out early again and met up with and Guided Tim O’Connell and his 11yr old son Keagan….we had cold and snow early but it warmed up nicely and we had a good day catching a mix of rainbows and brookies on a variety of my new bead head patterns and midge patterns. Small patterns ruled as the water dropped a bit since the weekend and when that occurs smaller patterns are always a good idea. 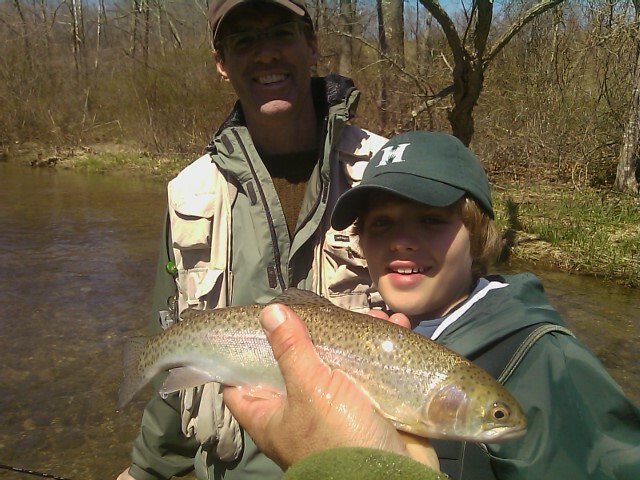 We also were heartbroken as 11yr old Keagan hooked two huge rainbows and the first one broke off right away while the second one gave him a bit of tussle and made a hard run upstream and jumped 2-3 feet into the air and broke off—it was a 23-25" rainbow that appeared to be of the 5-6lb size…….There’s always next time! Had a scheduled trip with Thomas Nelson of Greensboro, NC today but the water was up and pretty mucky so we decided to reschedule. Probably could have made it work as I knew of a couple of spots that might have been fishable with all the rain. Will be watching the weather radar with interest to see what this next round of rain will do. Have a week full next week of trips to prepare for beginning with a two day trip with Dr. Ken Karb Greensboro, NC, Dr. Hy Muss of Chapel Hill, NC, and Dr. Rich Goldberg of Chapel Hill, NC. Hope the rest of your week is good and stay dry……! Good fishing…..
Another Early Start, Its Chilly…..! Sat…Mar. 26, 2011……Another great day despite a 45 degee shift in temperatures and some rain and snow. Guided Dr. Jerry Chostner and his son Keith from Blacksburg, VA. We had quite a weather change, went from fishing in short sleeves earlier in the week to bundled up and fishing in snow and freezing rain. Most of the worst of it held off til the end of the day but it was still plenty chilly. 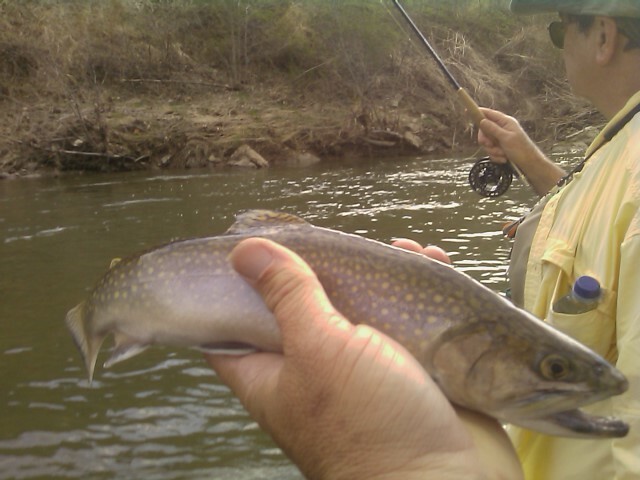 We caught a good many fish, most of them on a variety of bead head patterns. 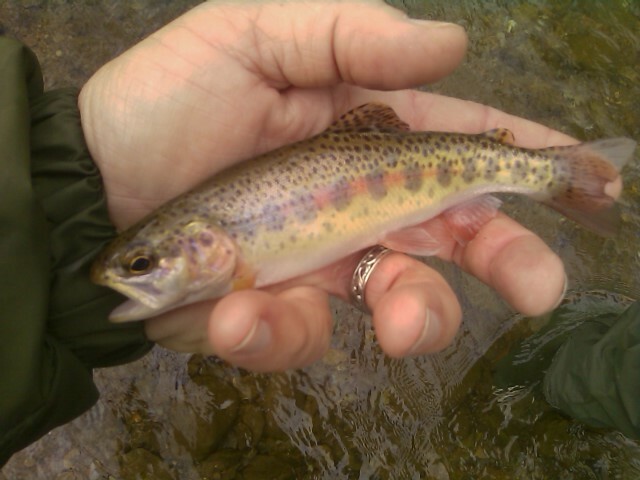 The water was high so there wasn’t any dry fly action to speak of. In fact, the stream was bank full and more wet weather is in the forecast. Caught a couple of citation rainbows and lost a couple as well. Some new flies are working well, particularly the new bead head flashy CDC caddis emergers. Guiding a trip on Monday with Claudia Cannady and Susan Singer. Should be a good day as we are supposed to have more cloudy and wet conditions. Ought to bring some large fish out. Hope you have a great remainder of the weekend….! Soggy Saturday Coming Right Up…. Thurs……Mar.24, 2011…….Still giddy over the awesome day Dr. Pat Burney and I had on Tuesday. 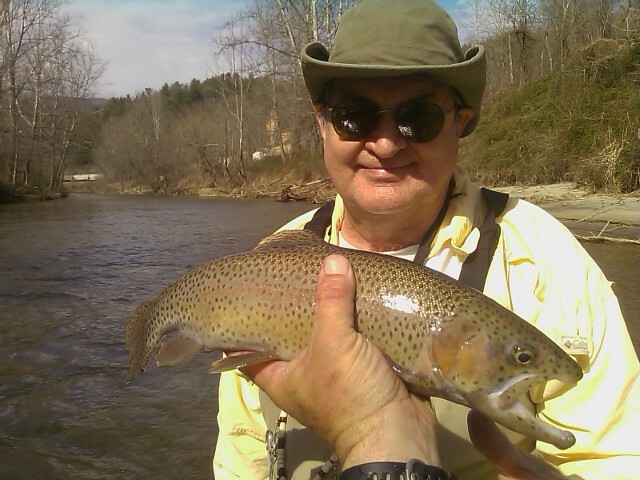 It was truly a great day, we caught some good fish and almost 50 altogether. 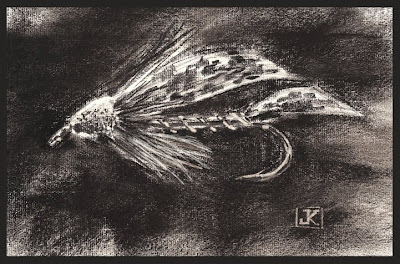 Had the opportunity to fish a lot of new fly patterns I have been working on. No fishing today, did some fly tying instruction for much of the day. Shared some of my new patterns……trout chocolates I guess you could say. Much of the mountains got a good soaking again yesterday with the frontal system that passed through. Some locations got a half inch while some areas in SW Va got as much as 4 inches or more. A lot of places are high and unfishable, others are becoming fishable as runoff clears through. A big weather change as tonight’s low temps are low 30s while the mountains will see 20sF and scattered snow flurries. Will have another report for the upcoming weekend….Have a great evening! 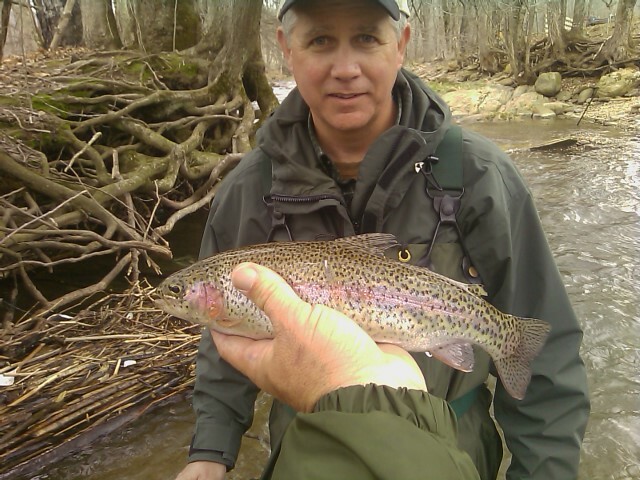 Tues……Mar.22, 2011….Guiding Dr. Pat Burney today and we have had an incredible day so far, we have been smokin’ them. Pat has done a super job of reading the drift, recognizing the strike, and setting the hook. 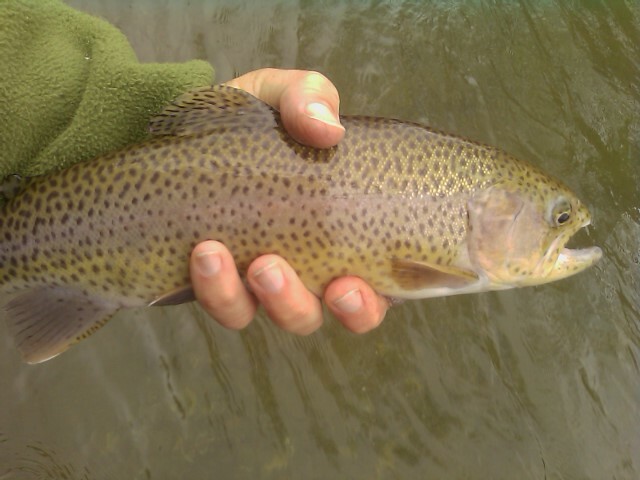 We lost a huge rainbow that shook off, we have landed about 40 or so a mix of browns, rainbows, and brookies, and even a smallmouth. I have been pleased with the performance of some new patterns, a march brown flashback teamed up with a Glass Bead CDC emerger, we caught about 12-15 fish in a row on the midge, it was incredible. 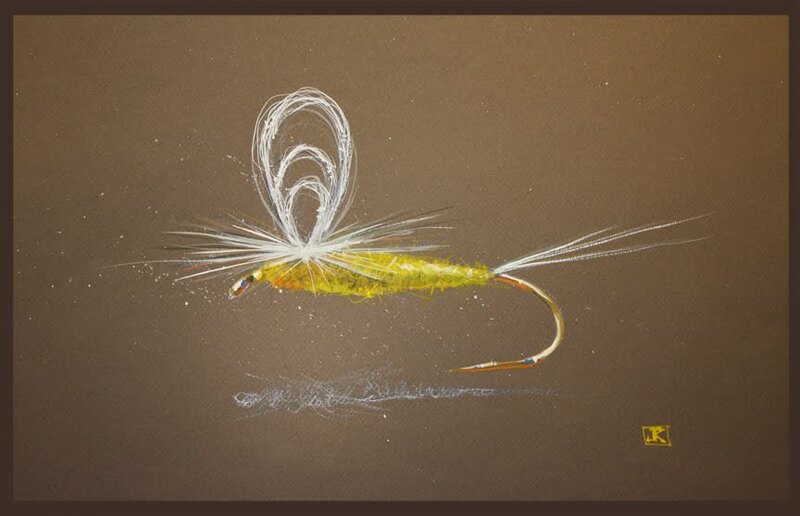 Also have been working on what I calla bead head micro bugger….it has been killing them and the larger fish love it. We are taking a lunch break and heading to another part of the river. More to come…. Great Day, It Wasn’t Fishing…. Should be another good day……..Have a great one..!